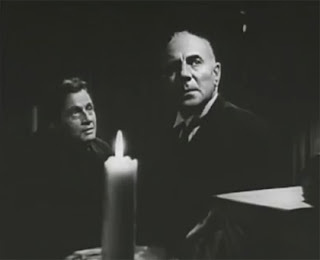 Whilst the very lowest of low-rent studios were not slow to jump on the horror bandwagon, they never had the budgets or the rights to compete with the likes of Universal and its roster of creature features; which is why it’s remarkable, as Tom Weaver points out, that “in the 1940’s Poverty Row, oddly, avoided vampires almost scrupulously.” After all, a sober suit, optional opera cloak and fangs, plus a hopefully hypnotic rather than laughable stare costs very little. The result is sixty-four minutes of tedium that belies its brevity in making you feel it’s three times as long, an almost impressive feat when you consider that it was filmed in a scorching five days. Not one calorie of that kinetic energy however seems to have translated onto the screen. Instead, the film crawls along at a deadening pace. The prologue initially raises hope, consisting of a book of vampire history being tossed onto a fire, followed by a spectral head (Forrest Taylor) accusing the audience of having the “puny conceit” to doubt the power of the supernatural. He suggest we are to encounter “witch and warlock, werewolf, and all the spawn of Hell, borne on the sable wings of night through the holy communion of the witches’ Sabbath.” What a mouth-watering invitation. If only we could believe one wing-flap of it would be on offer here. We switch to the funeral of one of two twin brothers (both played by Zucco). The deceased Dr Elwyn Clayton was originally a good man whose soul was corrupted by the dark arts of witchcraft after returning from India. His surviving sibling, Dr Lloyd, offed him in secret to save the town from his hideous occultry. We understand this when grieving local Kate (Ferm Emmett) bursts in to lambast his coffined body at the altar. He had murdered her grand-daughter, this “Servant of the Devil”. Lloyd takes Kate’s pained outburst in his stride. Indeed Zucco more or less handles the entire film as though it’s a leisurely round of golf through which he mutters his lines on auto-pilot. Away from the public show, Dr Lloyd meets his niece Gayle and her fiancé Dr David Bentley. The former is played by the able and beautiful Mary Carlisle, who had risen to become a musical comedy co-star of Bing Crosby three times before marriage persuaded her to make this film her last. As Dr David we have Nedrick Young, who thankfully was a strong writer - weathering the McCarthy blacklist to co-write Elvis Presley’s Jailhouse Rock (1957) and earn an Oscar as the pseudonymous Nathan E. Douglas for 1958’s The Defiant Ones - because his performance here in front of the camera is dreadfully wooden throughout. Once the lovebirds have left, having passed judgement on the “black and evil thing” they’ve just buried, in private, Dr Lloyd is burning his brother’s unsavoury notes when he is assailed by the crazed appearance of the latter’s hunchbacked henchman, Zolarr. 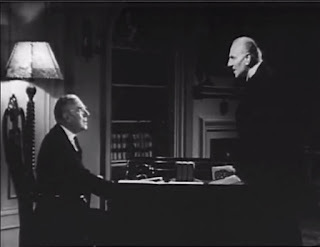 It is good to see Dwight Frye again, even though the years’ mileage had clearly not been kind to him since his promising one-two of Dracula and Frankenstein roles in 1931. By now, he was largely reduced to trying to balance his time between unremarkable stage roles and war effort factory work for Lockheed Aircraft, hence his haggard, prematurely-aged appearance. Tragically, he died that November before reporting for work on Fox film Wilson (1944). In his last role, at least his engine still summons up the red-lining revs of frenetic servitude that made and limited his name. “You’ll pay for death long before you die!” he gibbers at the sight of Lloyd’s dishonouring of his dead master’s work. True to his word, Elwyn sneaks into Gayle’s room for a swift pint one night. This causes our heroes to go into crisis mode, which for Dr David means behaving as though he’s been ex-sanguinated himself, such is his bloodless acting. He’ll need every drop though as he steps up to offer his own matched blood type to give his fiancé a rejuvenating transfusion. To be fair, Dr Dave is at least a less erratic physician than his prospective father-in-law. He noticed the tell-tale puncture marks on Gayle’s neck immediately. Lloyd, perplexed over Gayle’s sudden anaemia, missed them completely in his presumably full examination, - even though he spotted them on a previous victim. It just shows the value of getting a second opinion. It takes Kate to fully understand the demonic forces at work here. She warns Lloyd and Gayle that they are up against a vampire who can only be deflected by a crucifix she gives to Gayle. And sure enough she is proved right when a glowing-eyed Elwyn pays her a return visit but is foiled. You would think these plot developments would create some interest, yet I hate to say it but Zucco is one of the main culprits in the slowness of the piece. As Dr Lloyd he prefaces each exchange with ponderous thought as though attempting to diagnose his own boredom. This would be understandable if the dialogue was worth savouring, but Myton’s script is likewise cripplingly dull. When Gayle asks what he thinks of Kate’s utterly fantastic story, he replies drearily: “I don’t know, dear. It seems utterly impossible and yet it’s the only answer to an impossible condition”. Not for Zolarr it isn’t, who offs Kate for being wise enough to supplying that the answer. 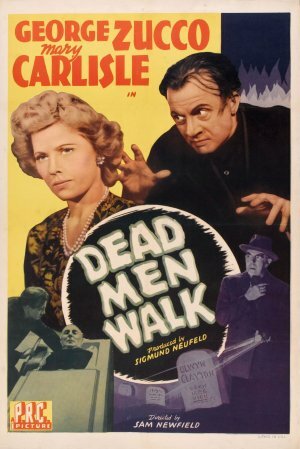 Dead Men Walk is a tepid Dracula rip-off that never stands a chance by being hamstrung from the start due to its tortuously slow rhythm, dull acting and slapdash, quickie execution.